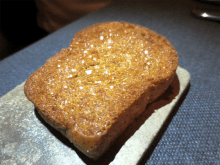 I've been to Sons & Daughters twice over the years, first in 2010 when they were relatively new, and again in 2011 after they'd received their first Michelin star. Both times the food was tasty and modern, with a fairly unique approach to hyper-local, ingredient-driven cuisine. 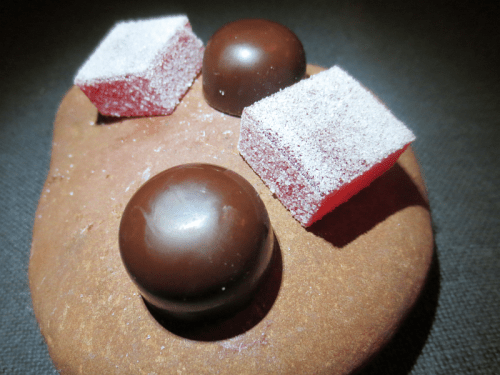 I left both meals feeling generally happy with what I had experienced, but in the back of my mind there was something missing; I felt as though the restaurant wasn't reaching its full potential and that, with a few small tweaks, those meals could have been memorable instead of relatively unremarkable. That all changed last Sunday when, on my third visit to Sons & Daughters, I experienced a meal that wasn't just remarkable, it was flawless. Whoooooaaaa, I know, flawless is a pretty strong word. But I assure you it's no exaggeration. When you find yourself in my shoes, picking apart an 8-course meal in search of any little mistake, and all you can come up with is, "Well the halibut was totally moist, but maybe it could've been just a liiiiittle bit more moist?"... you've just had a flawless meal. The flavors were delicate but pronounced, the execution impeccable, and the plating more beautiful than I had previously remembered. That said, what really made this meal extraordinary for me was its novelty, both in ingredient and approach. Something as common as a roasted golden beet was reinvented into something original, all without becoming overly complex or intellectual. I mean, how often are you surprised and swept off by beets? In a way it reminded me of Coi, in that each dish is so seemingly simple yet so well conceived that, when executed perfectly, it goes far beyond what you'd expect. Sons & Daughters has hit its stride, bringing a surprisingly fresh and modern perspective to the garden-inspired tasting menu. So what changed? Probably the biggest change is that, over the past year, 90% of the dishes featured on the tasting the menu have come from the brilliant mind of Chef de Cuisine, Duncan Holmes. Although he's been with Sons & Daughters for two and a half years, it wasn't until this past year that chef/owners Teague Moriarty and Matt Mcnamara took a step back from the day-to-day work in the kitchen, allowing Chef Holmes to take the reigns. Although having a talented team behind the stoves and a dedicated garden in Los Gatos has helped, in my eyes it's been the added influence of Chef Holmes that has pushed the cuisine to the next level. Okay, already, let's get into the food! It was too good to cut out any details, so buckle up because up - it's lengthy, but worth it! 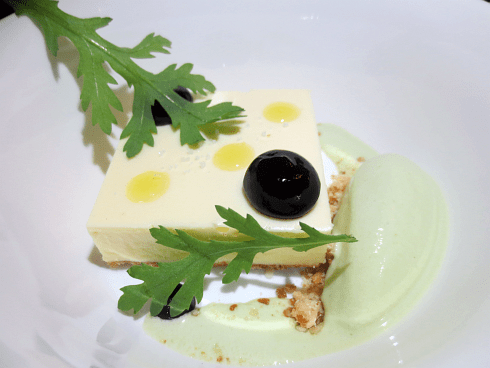 The first course kicked things off with, what else, Monterey Sea Grapes. Ahhhh yes, it reminded me of my high school days when I'd go to the lake for the day and pack myself a sandwich, some chips, and a big ol' bag of sea grapes for lunch! Of course that's completely ridiculous and untrue; I had no idea what sea grapes were until that night. But, you can understand why beginning with this made me chuckle. 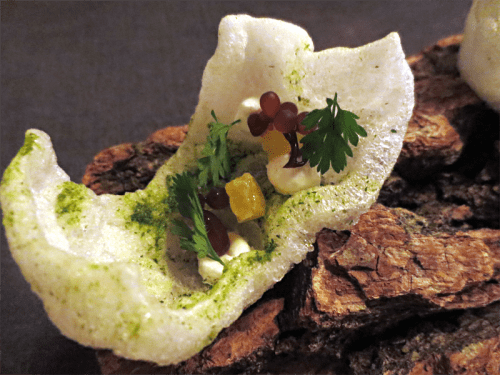 Turns out they're a type of seaweed which, when placed atop a buttermilk, tapioca crisp alongside dehydrated green onion (powder) and creme fraiche, looks like a fun, inventive take on caviar. Most importantly, it was bright and tangy, bursting and crunching in ways that made me write, "BANG, POP, POW!" in my notes on the dish. Clearly, a great start to a long meal. What followed was yet an equally surprising explosion in my mouth: Buff Orpington Egg served with baby cherry belle radish, redwood clover, fava beans/greens, and miners lettuce. I know, it sounds like a lot of leaves and weeds with lofty names right? 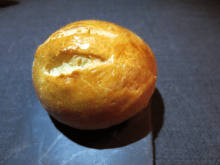 But, what they don't mention is that the egg is slow-cooked (at 60°C for 2 hours), stripped of its whites, wrapped in pastry crust, and fried. Imagine a piece of shrimp tempura. Now take out the shrimp and add a rich, barely-cooked egg yolk. Okay, now try to imagine the joy you'd feel when you placed that little fried ball of wonder in your mouth and it burst like the most delicious bubble in the world. Throw in a few bites of fresh, crisp veggies to balance the richness of said egg bubble and you've got a perfect follow up to sea grapes. Simple only in appearance, clean, and contemporary. The Roasted, Baby Golden Beets followed, which were brilliantly paired with greek yogurt, Vadouvan spices, and fresh fenugreek...Once again I needed to be educated. Fenugreek, as I was informed, is an herb/spice common in South Indian and Middle Eastern cuisine, whose leaves and seeds have a certain bittersweet quality that pairs particularly well coriander, cumin, and paprika. Thus, a well-conceived addition to the chunky Vadouvan made up of dehydrated shallot, onion, turmeric, chili flakes, cloves, fenugreek, cumin, coriander, and yellow mustard seeds (pickled in raspberry vinegar). 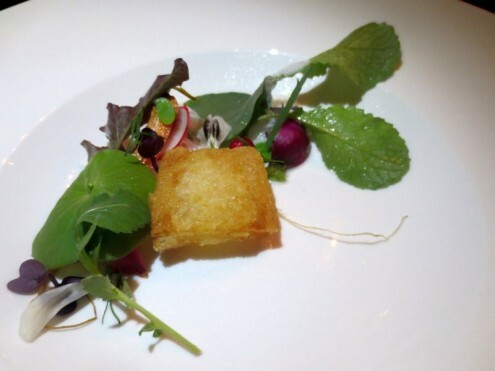 This dish was incredibly well thought out, taking a known flavor profile and updating it in a way that transformed conventional into unique. And the result was spot-on. The earthy, spicy tones tempered by the plain yogurt transported me to a bustling city in the Eastern Roman Empire - you know, the days of my childhood. 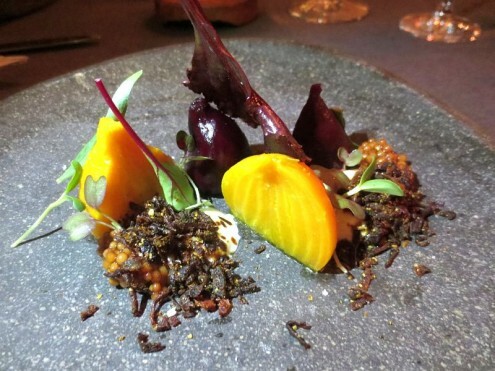 All I know is this: I was completely blown away by this dish and never would've guessed that a beet would be my favorite savory dish of the night. 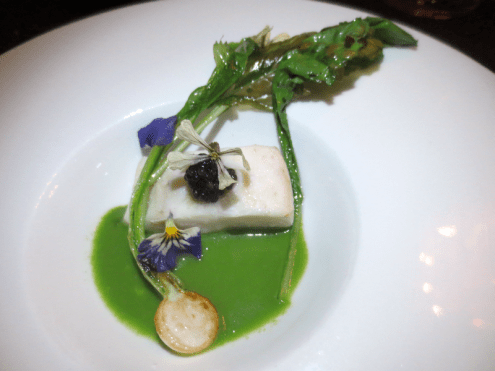 Next out was Local Halibut with green garlic soup, baby turnip, and caviar (real, not sea grapes). Although I would've preferred my fish to be slightly less cooked for textural reasons, that's just a personal preference, a minor note to what was a very tasty dish. 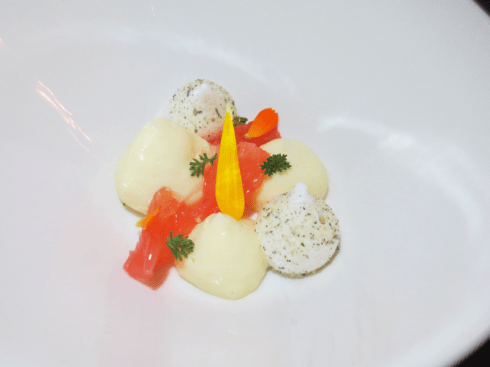 Overall, it came off as a well-balanced mingling of flavors that were simultaneously pronounced (the saltiness of caviar, subdued spice of green garlic) and delicate. They had another hit with their fifth course, Sunchoke with Maitake Mushroom and Roasted Garlic, with my notes reading, "Wow. Sunchoke. Nailed it." It was earthy, rich, and so delicious that I completely forgot to snap a picture before devouring it in its entirety. Instead I can only show you a glimpse of their house-baked breads, which were devoured equally as fast. 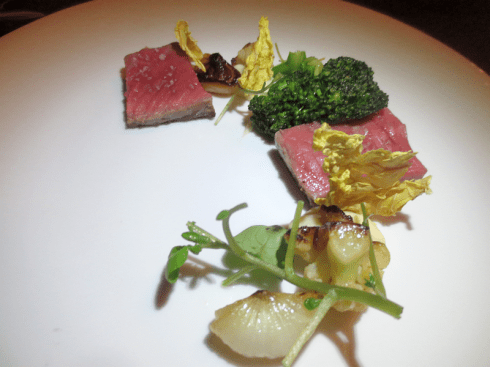 Finally, the Akaushi Beef, Seared Cauliflower, and Cippolini Onion was the final savory course of the meal. Despite it more traditional than most of the other dishes, it was really tasty in its simplicity. When meat is that good, why mess with it? By keeping it light and letting the beef shine, there were no problems finishing the plate, and no need to loosen my belt for dessert. It tasted familiar, classic, and as a final send-off to the bulk of the meal, left me feeling...comfortable. 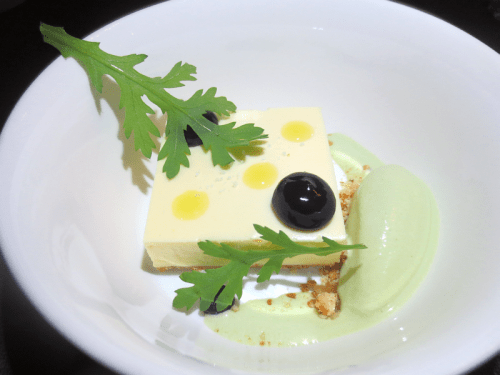 That comfort was quickly cast into the wind when I could barely understand any of the words describing the first dessert: Bergamot Curd, Sweet Woodruff Merinque, and New Yarrow. My first thought was, "THANK GOD THEY ADDED NEW YARROW. Old Yarrow would've been so trite, am I right? ... ... " This was followed by a string of questions until I finally stopped caring so much about words and let the taste tell the story. That story was as bitter (grapefruit) as it was sweet; extremely aromatic, and a wonderful palate cleanser before the finale. The last dish, a send-off made of Geranium Ice Cream, White Chocolate, Wild Huckleberry, and Black Pepper, was equally as innovative as the rest of the meal, and to say the meal ended on a high note would be a gross understatement. This was one of the best desserts I have had in recent memory. My reaction was similar to the one I had after trying Melissa Chou's desserts at Aziza for the first time: totally blown away. But, this dessert was so incredibly unique that it's impossible for me to make any real comparisons. It was classically simple in composition, with just enough contrast in texture to keep things interesting. And the taste was both traditional (white chocolate + huckleberry), and unusual in that it tasted simultaneously green, like something from the garden, and sweet, with flavors that were so fresh and so clean that I now associate this restaurant with Outkast. No joke. It sent me home pretty shocked; after such an exemplary meal, this last course was hands-down my favorite dish of the evening. To the guys in the kitchen I want to say, seriously, my hat's off to you. Absolutely phenomenal from start to finish. It has been a very long time since I've felt so inspired by a meal, so I want to end by saying thank you for giving me such a moving culinary experience. Beautifully written, I can almost taste the meal right now! But like you I was not raised on sea grapes, or sweet woodruff so I'll just have to wait 'till I go there. I've never been here, but an aunt of mine said that their Chocolate and pate de fruit (she kept referring to it as whatsitsname-choco-fruit) was so delicious it was to die for. Can't ascertain myself if her claims are true or not, but I'd like to find out for myself!